The Volvo XC90 is designed for all types of roads, irrespective of the surface beneath the tyres or the weather conditions. Even though it was never designed to be a serious off-roader, the Volvo XC90 has the versatile combination of electronically controlled Haldex All Wheel Drive (AWD) with Instant TractionTM and a generous 218mm of ground clearance for when the going gets tough. A high seating position gives the Volvo XC90 driver a feeling of safety and greater awareness of the road ahead, with the knowledge that he or she can control the car with the help of instant, well-weighted response from the chassis, engine and brakes. The chassis in the Volvo XC90 is designed to give the vehicle the same ride and roadholding characteristics as a passenger car. The suspension is more substantial, however, to handle heavier loads, as well as the higher ground clearance and all-terrain possibilities. The rear multi-link suspension is well isolated, with the dampers and springs attached directly to the subframe. This results in a quieter ride as road and transmission noise is largely filtered out before it reaches the bodywork. A wide track (1634mm front, 1624mm rear) and a long wheelbase (2857mm between the front and rear axles) make for exceptional stability, so the new Volvo XC90 behaves consistently and dependably, even on curving, twisting and uneven roads. The XC90 R-Design features dynamic chassis settings, stiffer anti-roll bars, firmer shock absorbers and sport tuned speed-dependent steering. The shock absorbers have stiffer rebound rates and the anti-roll bars are stiffer (front +0.5mm; rear +1.0mm) to offer a high level of stability when cornering. The speed dependent steering has also been adapted to offer a quicker steering response. Furthermore, Volvo's self-levelling system, Nivomat, has been fine-tuned to offer great stability and driving control. AWD with Instant TractionTMThe Volvo XC90's AWD (All Wheel Drive) system has the latest electronic system developed in conjunction with the Swedish specialist, Haldex. It operates independently of driver input, distributing torque automatically between the front and rear wheels for the best possible grip in all conditions. A 'pre-charged' function uses a non-return valve within the coupling, making 80Nm of torque instantly available to the rear wheels if the sensors detect any slippage. It feeds more power to the rear wheels as the car pulls away to improve acceleration. Once moving, power is balanced between front and rear, reducing drive to the rear wheels when not needed, and helping to reduce fuel consumption. The intelligent AWD system uses a variety of sensors to monitor the road surface and the steering wheel, brake and accelerator pedal positions. In normal driving conditions on dry roads, 95 per cent of the power is distributed to the front wheels. However, for off-road work, or if the sensors detect slippage, between 5 and 65 per cent of the power/torque is diverted to the rear wheels to maximise traction, if required. 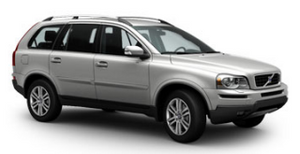 The XC90 further benefits from Volvo's TRACS anti-spin system and Dynamic Stability and Traction Control (DSTC). TRACS prevents wheel spin by transferring power across the axle if it detects a wheel is losing grip on one side. This means power is automatically and smoothly distributed to the wheels with the best traction at any given time. TRACS is deactivated during braking so the brake and ABS systems can function effectively, for high stability and shorter braking distances. In addition, the DSTC system increases driving safety on twisty roads and in slippery conditions by using sensors to detect if one of the driven wheels shows any sign of losing traction and cutting the power to it at lightning speed so it can quickly regain grip. And if the car shows any tendency to skid, the system automatically brakes the relevant wheels to help maintain smooth control.